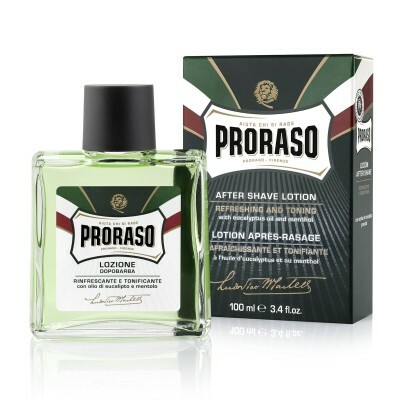 There is nothing quite like a clean shave and getting this type of result requires using the best razor possible. Many men suffer from shaving irritation, ingrowing hairs and poor quality shaves from using electric razors or plastic cartridge razors. 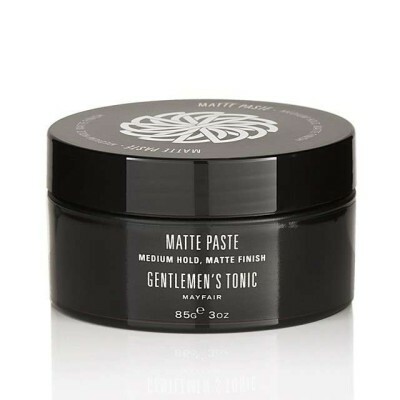 For these reasons many men are turning to the safety razor as their preferred method of shaving. The sharp single blade gives an extremely close shave without needing multiple blades to go over the same area which can lead to irritation. A safety razor is defined by a single double-edge blade. These razors were developed in the early 1900s to give people the ability to shave themselves. Before that, many people relied on professionals for their shaving needs since the razors could be difficult to use and maintain. The safety razor, therefore, was created to minimize risks and empower people to shave at home. Today, safety razors use the same basic design of these original razors. 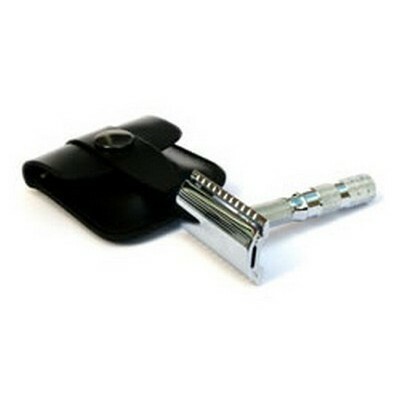 The single double edge blade is installed in the head of the razor and attached to the handle. 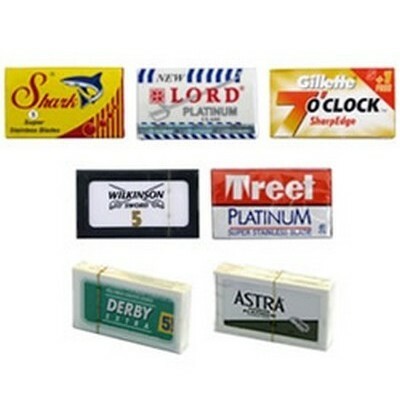 Modern brands include Merkur, Edwin Jagger, Muhle and Parker and all razors use the same type of double-edge razor blade. Another advantage of safety razors is that the replacement blades cost as little as £0.15 each which makes them considerably cheaper in the long run. It is possible to pick a safety razor in a variety of colors and styles. Since a good double edge safety razor can last for years when properly maintained, it is worth investing in one that performs well and looks good. The design options vary from bold colors to sleek metals. When purchasing a double edge safety razor, be sure to consider additional blades and equipment. 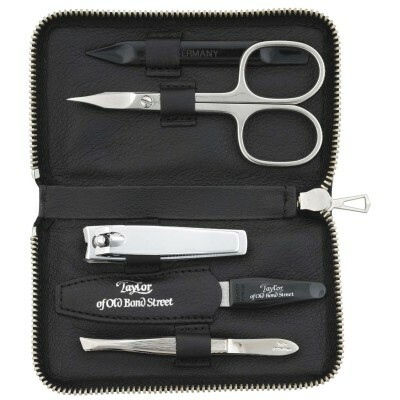 We recommend a razor blade sample pack in order to try a few different blades to see what works best for each person. 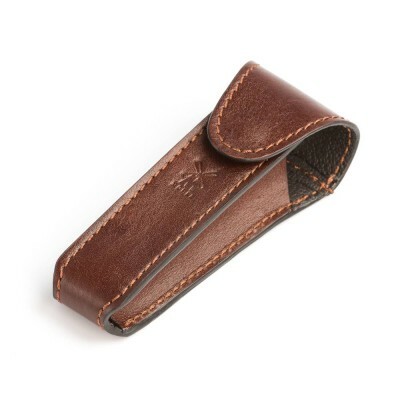 A razor case and blade guard can offer superior protection, minimizing long term damage. A good safety razor can last for years. Be sure to pick the right one for a lifetime of quality shaving experiences. Merkur Classic Open Comb 15C safety razor in chrome finish. This is a classic Merkur safety razor with a 3-piece lightweight design. 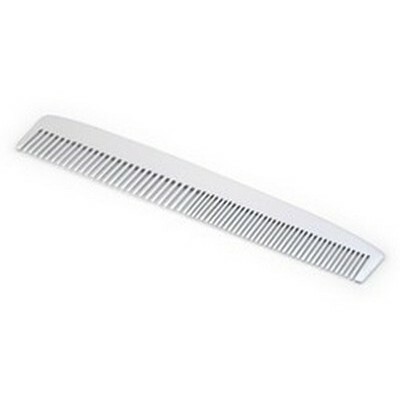 The open comb is especially suited to a heavy beard. Supplied with one Merkur razor blade. 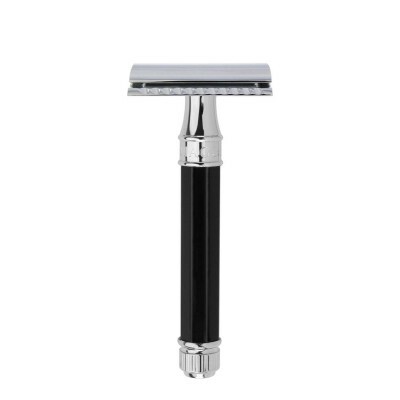 Merkur 20c double edge safety razor in chrome and black. 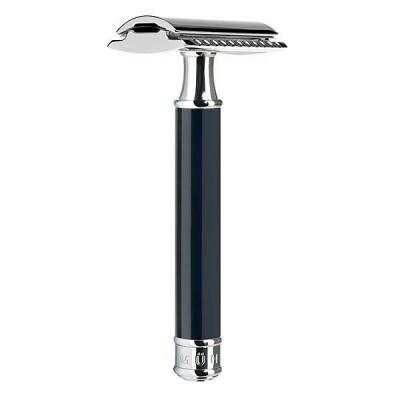 This long handled safety razor has a narrow anodized aluminium handle with a black deeply grooved handle which offers excellent levels of comfort and grip. 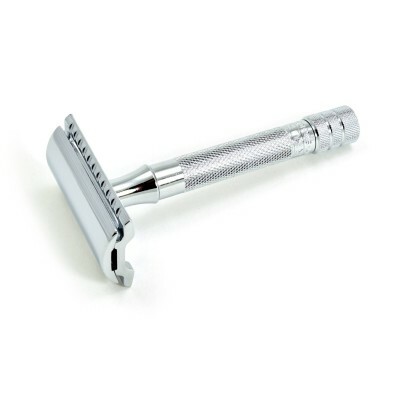 The razor features the same closed comb head as the popular 34C HD safety razor from Merkur. 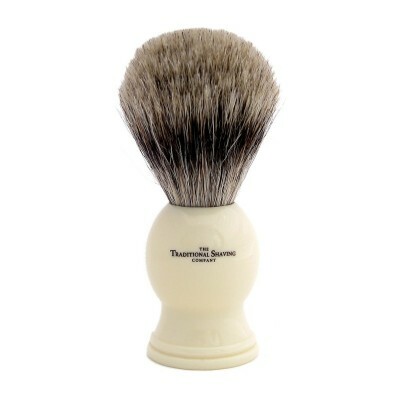 Also available in a shorter handled razor in the 30c. 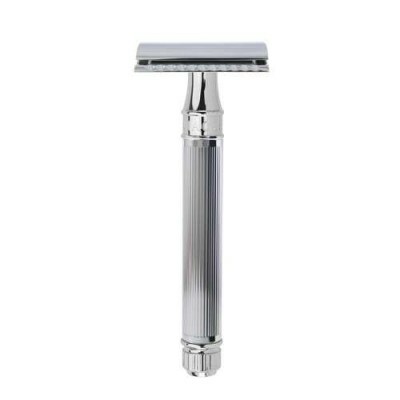 Merkur Long Handle Open Comb 25C safety razor in chrome finish. 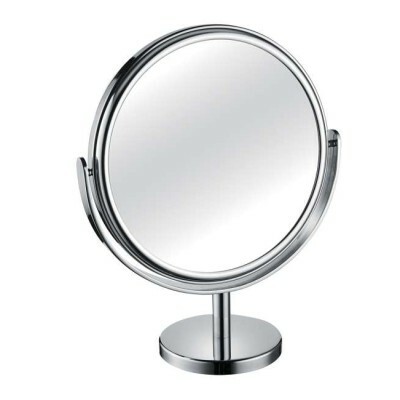 The 25C features a similar 3-piece light weight design to the 15C but features a longer handle. The open comb makes the razor suitable for heavy beard types. Supplied with one Merkur razor blade. 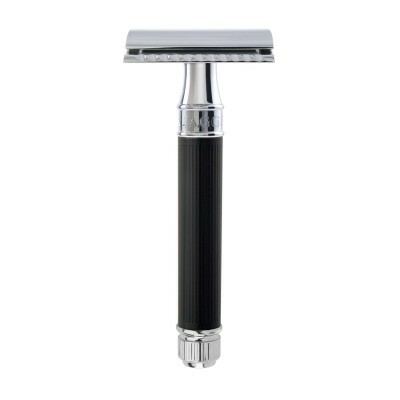 Merkur 30C double edge safety razor in chrome and black. 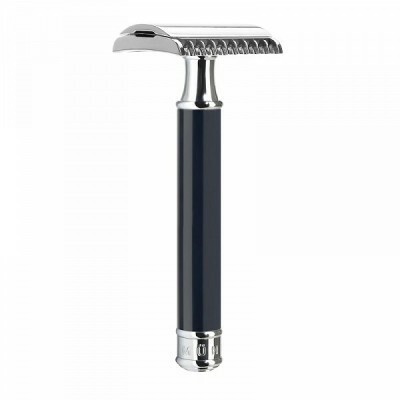 This short handled safety razor has a narrow anodized aluminium handle with a black deeply grooved handle which offers excellent levels of comfort and grip. 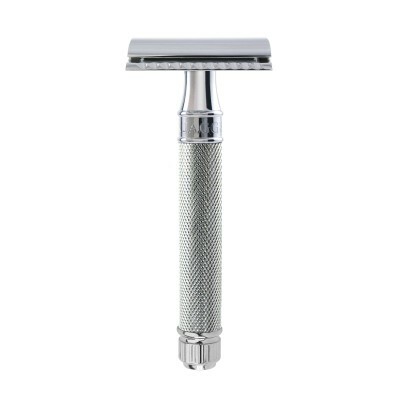 The razor features the same closed comb head as the popular 34C HD safety razor from Merkur. 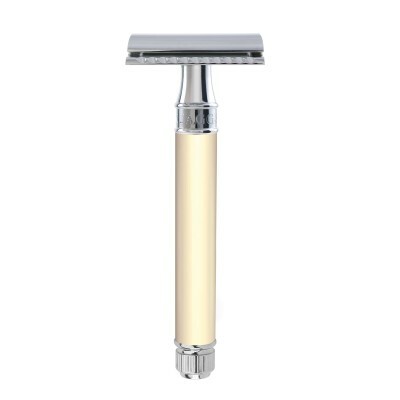 Merkur Classic 33C safety razor with chrome finish. 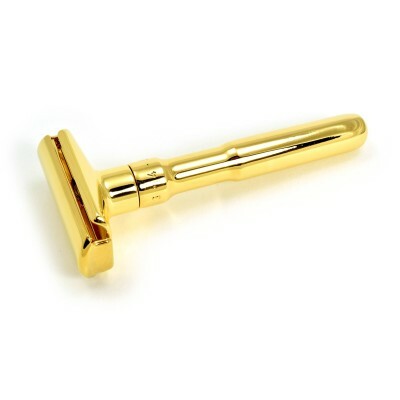 This is the classic Merkur safety razor and one of the more popular designs available. Supplied with one Merkur razor blade. 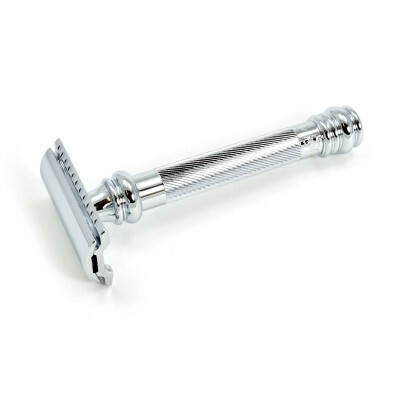 Merkur HD 34C double edge safety razor in chrome. 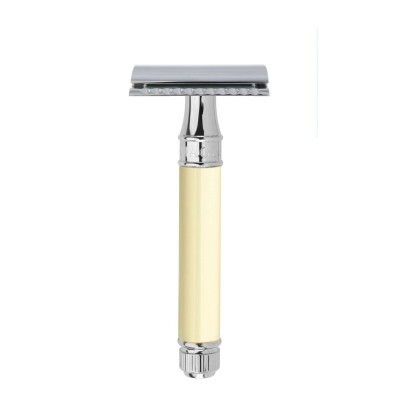 The famous Merkur classic HD (Heavy Duty) safety razor is know for both it's performance and simplicity. 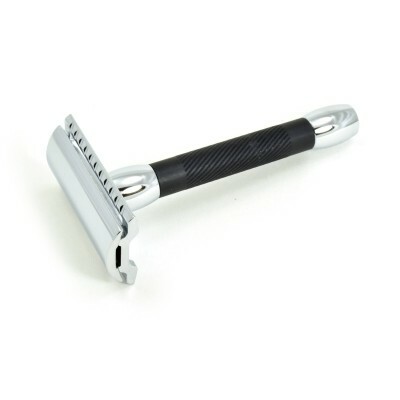 The short handle and weighted head offer perfect balance and are one of the reasons this razor is recommended so highly to beginners and experts alike. Supplied with one Merkur razor blade. 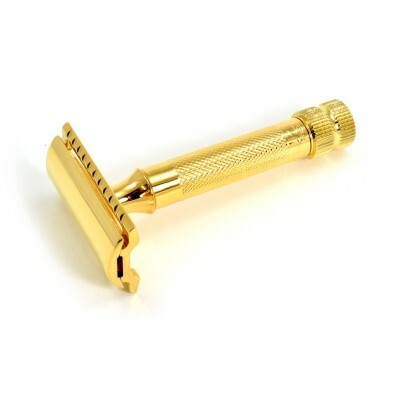 Merkur HD 34G safety razor with gold plated finish. 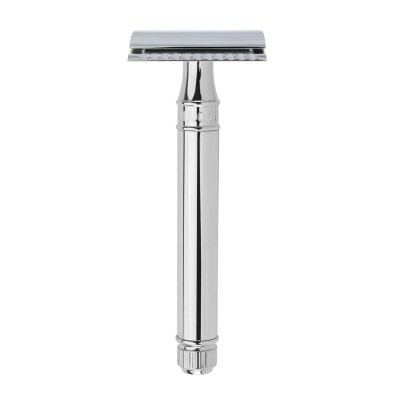 The famous Merkur classic HD (Heavy Duty) safety razor is know for both it's performance and simplicity. 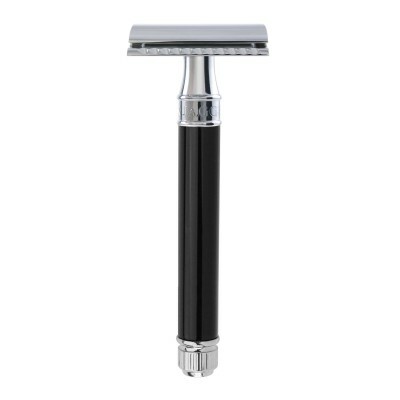 The short handle and weighted head offer perfect balance and are one of the reasons this razor is recommended so highly to beginners and experts alike. Supplied with one Merkur razor blade. 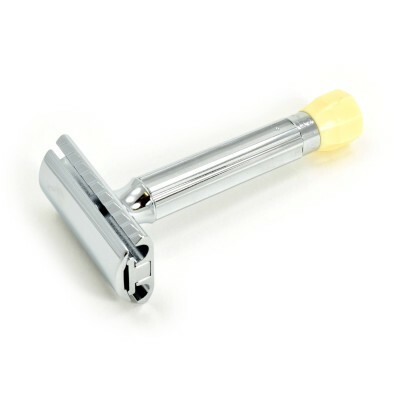 Merkur Slant 37C safety razor in chrome. The Merkur Slant is very similar to the Merkur HD but with a slanted blade exposure. 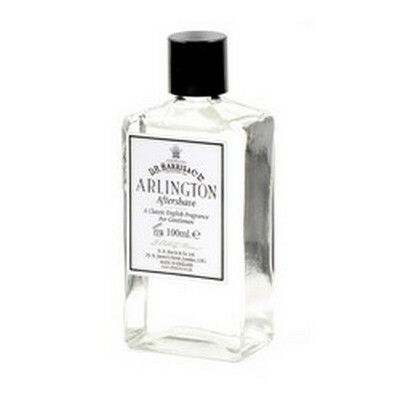 Recommended to people with the unfortunate combination of a heavy beard and sensitive skin and able to product an incredibly close shave. The Slant is a chrome plated heavyweight safety razor. Supplied with one Merkur razor blade. 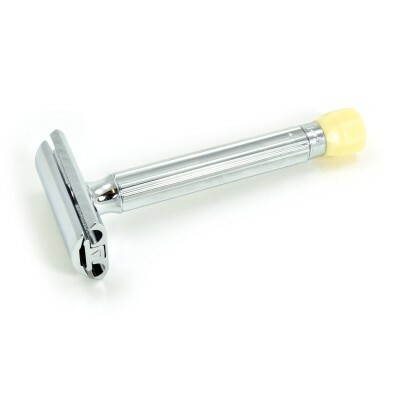 Merkur HD 38C Barber Pole safety razor. 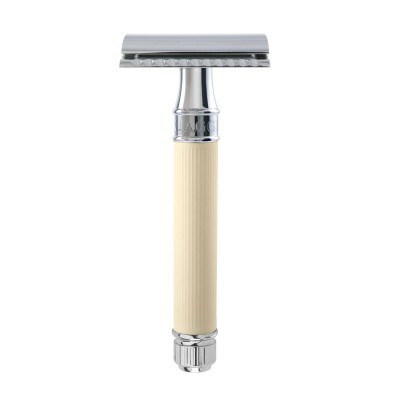 The barber pole 38C safety razor is a longer handled version of the Merkur HD 34C. Built to the same high quality as the 34C the additional length alters the weight and balance of the razor. Merkur Slant 39C Barber Pole safety razor. The barber pole slant bar 39C is a longer handled version of the Merkur Slant 37c. 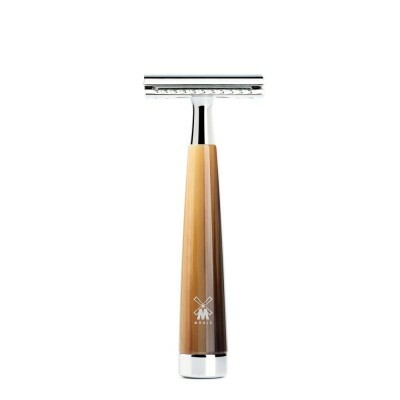 Built to the same high quality as the 34C the additional length alters the weight and balance of the razor. 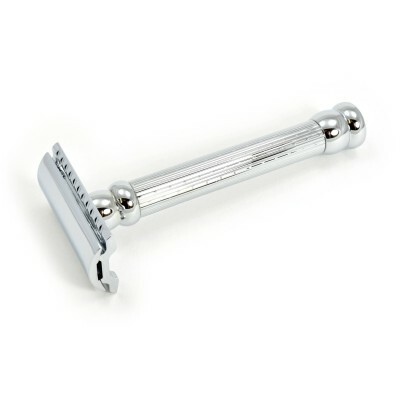 Merkur Classic '1904' 41C safety razor in chrome finish. Inspired by the original 1904 Gillette safety razor this razor features a distinct diamond pattern on the handle. Supplied with one Merkur razor blade. 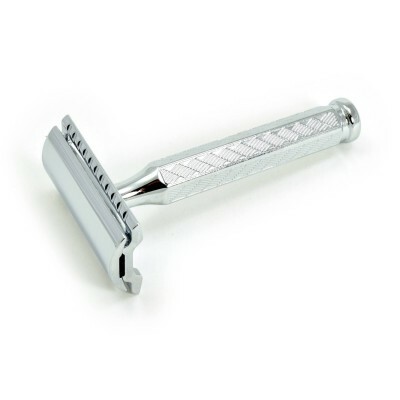 Merkur Classic '1904' 42C safety razor in chrome finish. 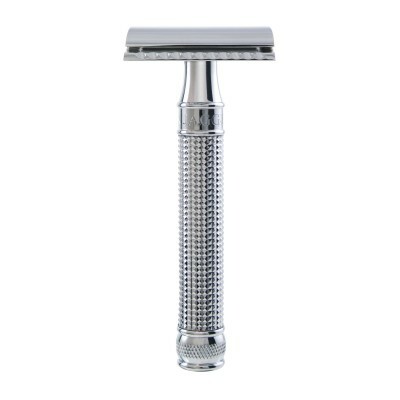 Inspired by the original 1904 Gillette safety razor this razor features a distinct diamond pattern on the handle. Supplied with one Merkur razor blade. This is the closed comb version of the 41C. Merkur 43c double edge safety razor barber pole in chrome. 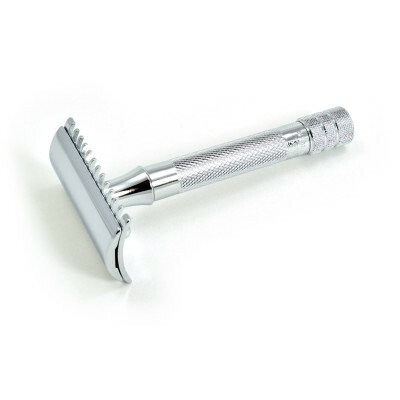 This is one of Merkur's heaviest razors due to the long thick handle but thanks to the expert engineering of the razor head it is not too aggressive. Merkur 47C safety razor in chrome finish. This Merkur safety razor has a 3-piece design with a long heavy handle. The closed comb is suitable for all beard types. Supplied with one Merkur razor blade. Merkur Progress safety razor. The Merkur Progress is a chrome plated safety razor that is adjustable. 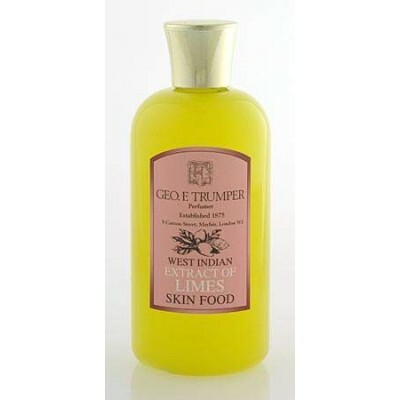 Ideal for those with sensitive or normal skin. Supplied with one Merkur razor blade. Merkur Progress long handle safety razor. The Merkur Progress is a chrome plated safety razor that is adjustable. 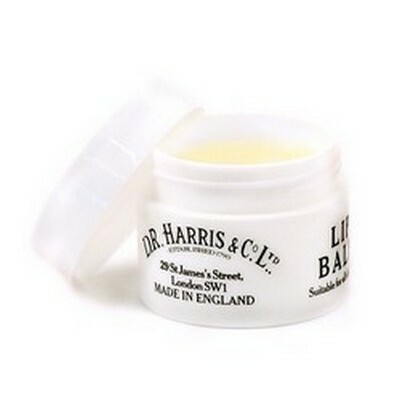 Ideal for those with sensitive or normal skin. Supplied with one Merkur razor blade. Merkur Progress safety razor in travel case. The Merkur Progress is a chrome plated safety razor that is adjustable. 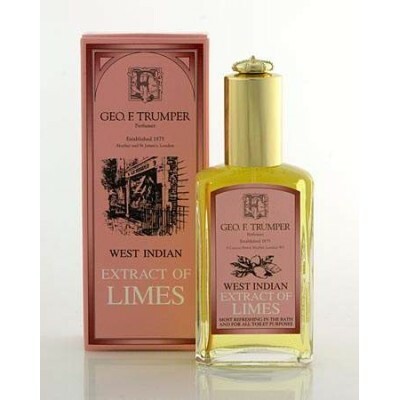 Ideal for those with sensitive or normal skin. 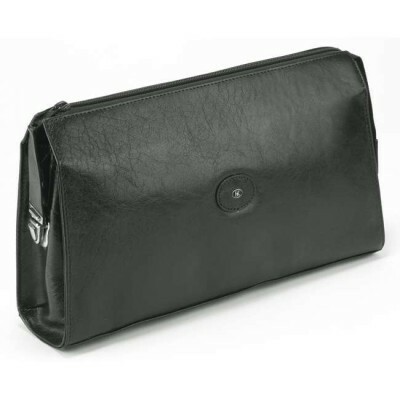 Supplied with one pack of Merkur razor blades and a plastic travel case to carry both razor and blades. 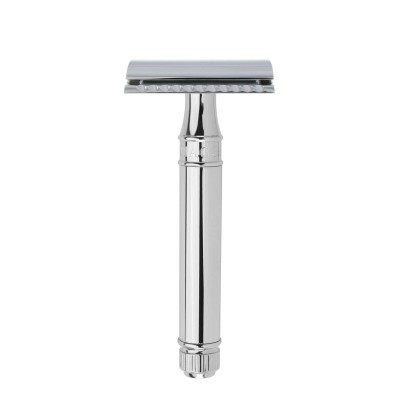 Merkur Futur safety razor with brushed chrome finish. 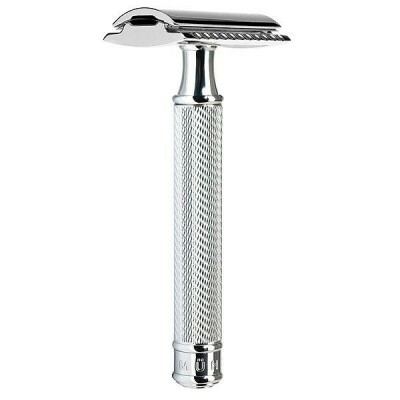 The Merkur Futur is a heavyweight safety razor. Beautifully balanced - this stylish modern razor is also adjustable allowing you to set the blade exposure to your exact taste. 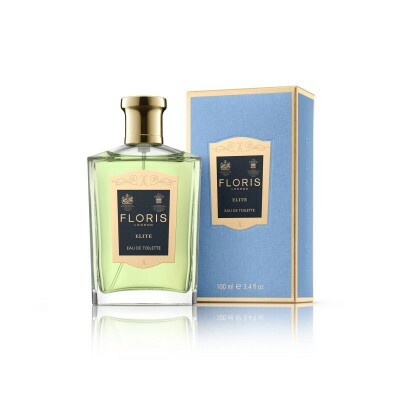 Ideal for those with sensitive or normal skin. Supplied with one Merkur razor blade. 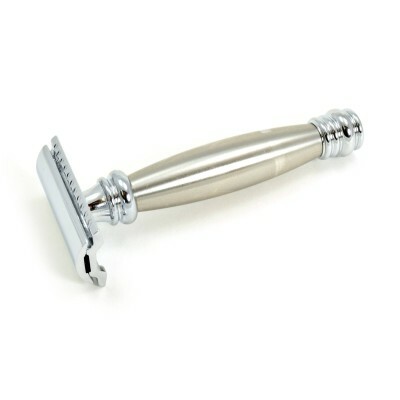 Merkur Futur safety razor in chrome finish. The Merkur Futur is a heavyweight safety razor. Beautifully balanced - this stylish modern razor is also adjustable allowing you to set the blade exposure to your exact taste. 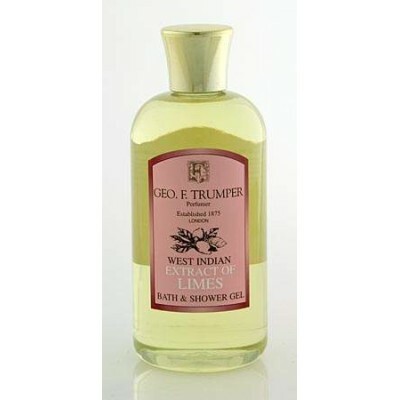 Ideal for those with sensitive or normal skin. Supplied with one Merkur razor blade. Merkur Futur safety razor with gold plated finish. 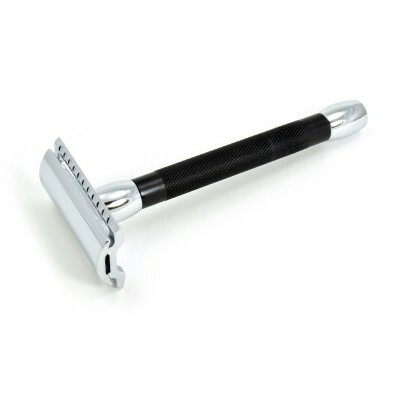 The Merkur Futur is a heavyweight safety razor. Beautifully balanced - this stylish modern razor is also adjustable allowing you to set the blade exposure to your exact taste. 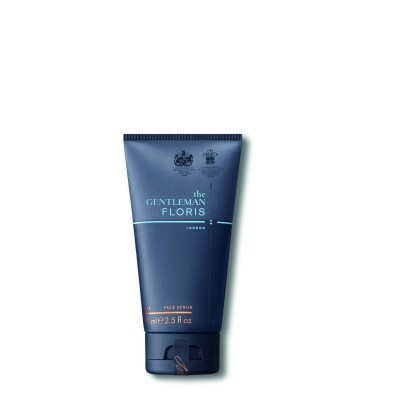 Ideal for those with sensitive or normal skin. Supplied with one Merkur razor blade. Mühle safety razor blade guard. 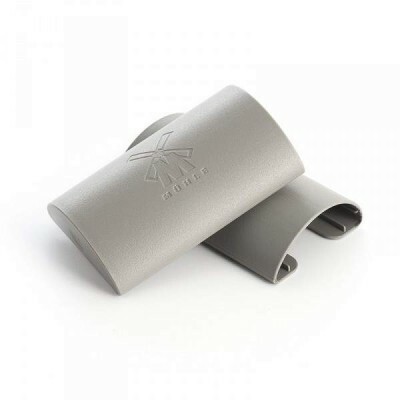 The blade guard made of plastic protects the blade and prevents from cuts when storing the safety razor or while traveling. 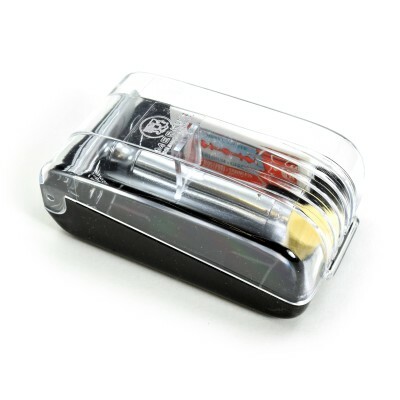 Works for all MÜHLE double edge safety razors with open and closed comb.